I was a collectables antique dealer for almost 30 years between London and Paris mainly but later included New York. One of my many themes was aviation and ballooning. I had a stand indoors every Saturday morning in the Portobello Road market for 30 years and met an Aviation collector and sold him a few prints and pieces of ephemera over the years. One day I received a phone call from Kent from the son in law of this collector. He said it was going to be his father in law's 60 birthday and did I have something special as a gift? Unfortunately not as he was a very advanced collector but as he sounded friendly and as I was an inquisitive person, I asked him what he did for a living. Cheeky me! He said he was a quantity surveyor working with architects. At the time I was into the subject of Feng Shui and Geomancy. Wanting to impress him, I asked him if he knew about Geomancy as, in Germany especially, Geomancy is THE key when building a house. 'No, but my Uncle Bill in London knows all about the subject and used to dowse for Lord Kitchener in Africa during the war'. Interested and curious, I asked where in London his Uncle Bill resided. His real name being Bill Cooper who had been involved in the wine trade. Why would I ask as London has millions of people and is a metropolis? I lived in Notting Hill at 164 Kensingon Park Road, London W11 having bought the property from Barbara Hulanichi of Biba fame - the fashion guru. I went hysterical with the synchronicity explaining I lived at 164 in the same road just a few houses down from his block. So that made us neighbours! I pleaded with him to organise a visit soon. A few days later Bill Cooper rang and arrived with Jill, his lifelong assistant who also lived on the same road. She had been his personal assistant in the wine industry and was now his companion as his wife was terminally ill. They arrived with brass rods galore and apparatus in bags!! They wandered throughout the four floor Victorian house paying special attention to the bedroom. Jill asked where the cat slept but I refused to tell her. In fact he slept on the left hand side at the bottom close to Martin's side of the bed. Martin had aching ankles and could always tell when it was going to rain! Then my tropical garden which I personally had created was dowsed after they had investigated the house thoroughly. I left them alone to make their plentiful notes. The result? According to Bill we had black lay lines running through the bedroom especially where Martin slept. Black lines in the lounge immediately underneath in the same position and also in the garden. What to do? Well they put brass rods in the earth in the garden towards the left hand side. What else I don't recall. They mysteriously unearthed a silver turquoise Navaho ring. Put there by Barbara symbolically perhaps? I don't remember being asked for a donation to the British Dowsing Society. There seemed to be no charge. Bill Cooper was also a faith healer and returned another time to visit Martin and give him a complimentary healing session. I think he came for a good conversation as Martin had an open mind into other ways of thinking. After all he was a magician. We were both into the world of conjuring, illusion and the associated performing arts. I forgot all about the world of dowsing until last week at a Brahma Kumaris lecture in a windmill in Brighton. After an interesting day, an Irish woman, who I had not noticed, approached me out of the blue and asked me if I would to join the Brighton Dowsing Society that met every month locally!!! Why me? Why do I attract nutty creative Individuals? 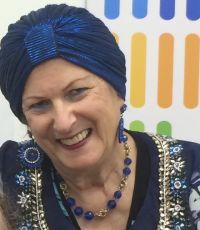 Could it be because I was wearing a black israeli head dress and an orange Indian flowing cotton tunic and looked, shall we say, unusual and colourful? Well I shall certainly go along should I be in Brighton and probably get my lovely Georgian flat checked out. Personally I believe I have white lines there as it is quiet and peaceful in a private park what was once the Sussex cricket club long ago and far away.